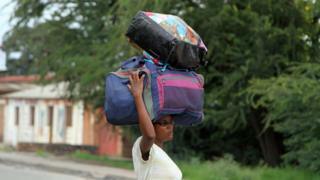 Scores of people are leaving their homes in Burundi's capital ahead of a promised government crackdown. A cycle of violence began in April with protests against President Pierre Nkurunziza's third-term bid. Mr Nkurunziza gave a deadline of midnight on Saturday for Burundians to hand in illegal firearms or face being "dealt with as enemies of the nation". Earlier this week, the UN secretary-general condemned the "inflammatory rhetoric" in Burundi. And the Brussels-based International Crisis Group said the language was "chillingly similar" to that used in Rwanda before the genocide of 1994. Agencies reported that many people were leaving Cibitoke and Mutakura, two neighbourhoods of the capital, Bujumbura, that have seen anti-government protests. Why do some leaders refuse to leave office? "Now I decide to leave as everyone is leaving," one elderly Mutakura resident, Marguerite Bigira, told the Associated Press news agency. "There is fear everywhere. But I still believe in God and all this will end." Another fleeing resident, Marie, told Agence France-Presse: "I was terrified, I understood that this time they would kill every last one of us." The violence, in which close to 200 people have been killed, began in April when the president said he would stand again. He argued that his first term as president did not count towards the constitutional two-term limit as he was chosen by MPs. Mr Nkurunziza was duly re-elected to a third term with 70% of the vote in July. The weapons ultimatum has led to a spike in killings. On Friday, the body of Welly Nzitonda, the son of a leading human rights activist, was discovered. UN Human Rights Commissioner Zeid Ra'ad al Hussein said the killing, which he called an assassination, "reinforces fears that there is a systematic policy of targeting members of the opposition, journalists, human rights defenders and ordinary citizens perceived to be opposing the government". UN Secretary-General Ban Ki-moon said the discovery of bodies in Bujumbura was now a regular occurrence - and many victims showed evidence of summary execution. Mr Ban said Burundian authorities had a responsibility to protect civilians. The International Crisis Group and others were commenting on remarks by Burundi's Senate President Reverien Ndikuriyo - who threatened to "pulverise" opponents who did not lay down arms. Uganda is leading regional efforts to broker peace talks and the UN Security Council is expected to discuss the violence at a meeting on Monday.